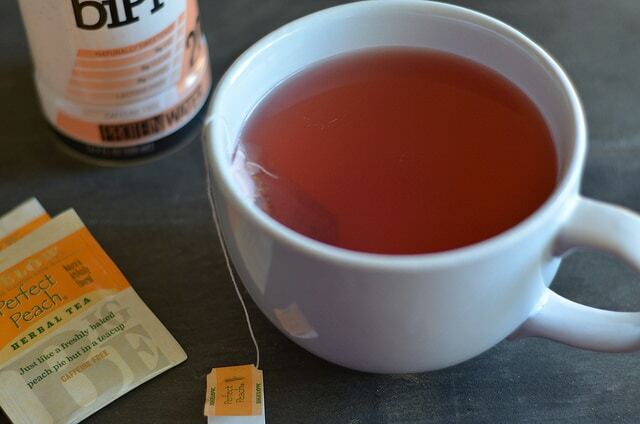 Do you know how long I’ve been looking for a fast and easy way to make protein hot tea? Nearly nine years, folks. That’s nearly a decade of longing and hoping and wishing that making something as simple as a cup of tea infused with protein wasn’t so…involved. Because freal, freal…it is. I mean, don’t get me wrong. My method for making hot protein drinks works like a charm every time, but I use that mostly for things like coffee or cocoa, where there’d ordinarily be a few steps to get it to taste exactly as I want it to taste. Usually, however, tea is an easy thing to make. But with protein? Not so much! Firstly, there’s the whole tempering the protein deal. Then there’s the fact that most protein powders are going to leave your tea…cloudy. Which I guess is ok if you are a “milk in your tea” kind of person. I am not. I like clear tea. Call me neurotic, but that’s who I am – and I like myself that way! S’anyway…this summer I was all excited about BiPro Protein Water cuz…well…it’s good! (Check out my video review here.) But then, as it usually happens, I begin to wonder how I can play with the product and get even more use out of it. So here’s how the process works in my head. BiPro Protein Water = Water. So you should be able to replace water with BiPro protein water and it will be ok, right? That was my hypothesis. I didn’t capture the experiment phase on camera, but my first hurdle was to figure out if you could boil the stuff. You can. But that isn’t necessarily the fastest or most convenient way to do this. So next, I turned to my trusty microwave oven. One minute and 45 seconds later, I had piping hot BiPro Protein Water! (By the way, if you do this…make sure your mug is microwave safe, mkay? Trust me when I say you don’t want to know why I am giving you that warning!) And to answer the question in your minds…no…nothing curdled. There were no rubbery/floaty anythings. Just clear, hot protein water. Now one thing I do have to give you a heads up about. The BiPro Waters do have a dry finish. My youngest daughter says it’s like when you eat Greek yogurt…that dry feeling in your mouth. Here’s where I stand with that. Yeah, that can be a bit displacing. However. On the days when my stomach has revolted, I need protein, and the thought of a chocolate-y/vanilla-y/creamy something or other is decidedly un-appealing to me? This was super comforting. 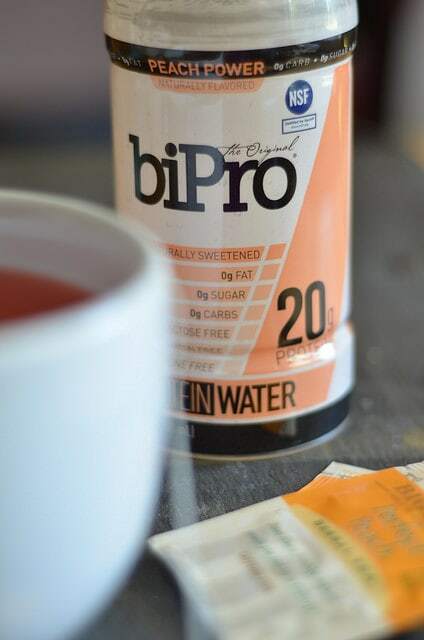 So…if you are in possession of some BiPro Protein Water…give it a try! For the record, here is the official method to make it. Step Three: Add anything else you like. Like I said, I didn’t need to sweeten mine, but you might! Also things like mint leaves would probably go great, depending on your flavor combo. So there you have it folks. 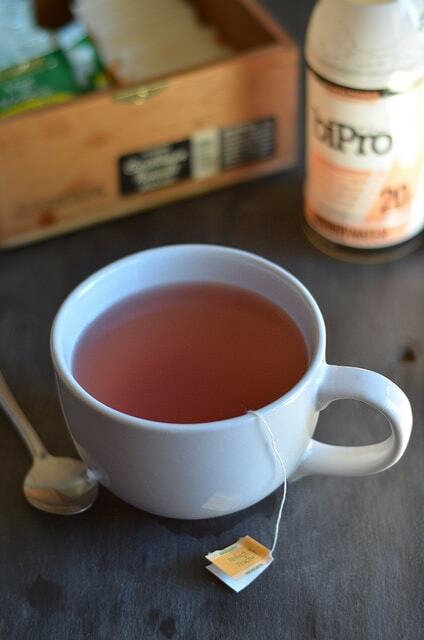 Super-easy, no-fail protein hot tea! Thank you, BiPro, for making this possible! Where can I get the bi pro water? At the regular grocery store or is this a specialty product?